Madison is definitely a food-lovers paradise but most restaurants don’t get featured in two local publications (Madison Magazine, Isthmus) before it even opens. I don’t remember why Dan Fox’s new restaurant Heritage Tavern got so much pre-opening attention, but I was definitely excited about going when some friends suggested it as our dinner stop for the night! Another reason I was excited about going to Heritage Tavern was because of the location. I went to Underground Kitchen before the apartment building above it caught fire and loved it. The atmosphere was awesome. The food was great. Needless to say, I was sad when Underground Kitchen decided not to reopen somewhere else (and yes, Forequarter, their new restaurant, is on my list!). So, I was also excited about getting to see how another restaurant would use the space. The Heritage Tavern space is broken up into two dining rooms, mainly because of the large brick wall separating the two sides. I love that there are steps down into the dining room closest to the kitchen. I thought the bare brick wall, tile floors and wooden chairs with a fox cutout were perfectly industrial and homey at the same time. I also loved the little appetizer plates with the pink pigs on them! I think the menu goes in two distinct directions: classic/savory and interesting/Asian. Those two flavor profiles also cross quite a bit on the menu. On my first visit my friends and I got the Tuna & Escolar Poke. I don’t usually do too well with raw fish but this was amazing. 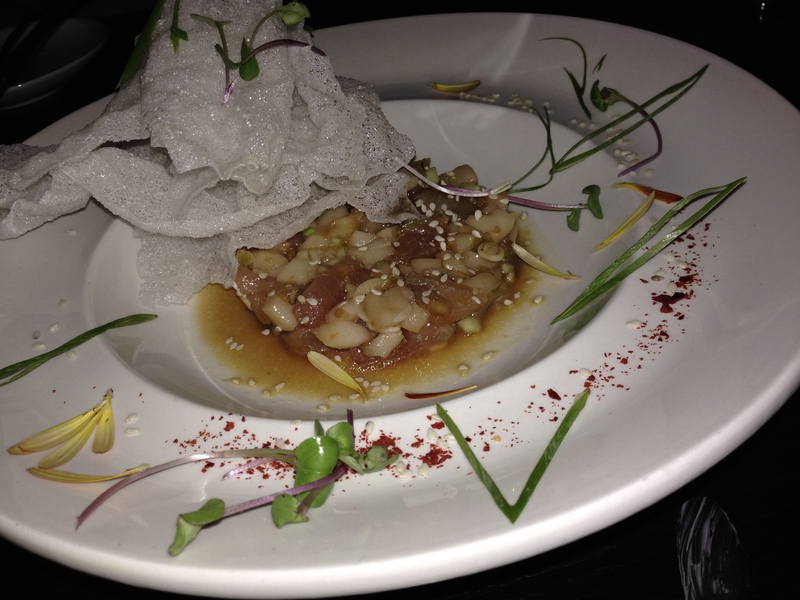 The tuna and escolar were not fishy at all, and they were a perfect marinated flakey texture. The marinade was not too salty but still had a great flavor. I was pleasantly surprised at how delicate the dish was considering the “tavern” in the name and my expectation of the restaurant to focus on meat, pork specifically. Along with our appetizer came a plate of bread, honey butter and house pickled vegetables. The bread and honey butter were not exceptional, but the house picked vegetables were fantastic! The pickle flavor was perfectly tart and had another level of flavor usually lacking in pickled things. I loved the pickle plate! For my entree choice I decided to go with fish and got the Great Lakes Whitefish. The fish was cooked perfectly with crispy edges and a flakey center. The clams on top and creamy grits on the bottom added a richness that was perfectly cut by the vinaigrette. The spinach and haricots verts were good but nothing exceedingly special. 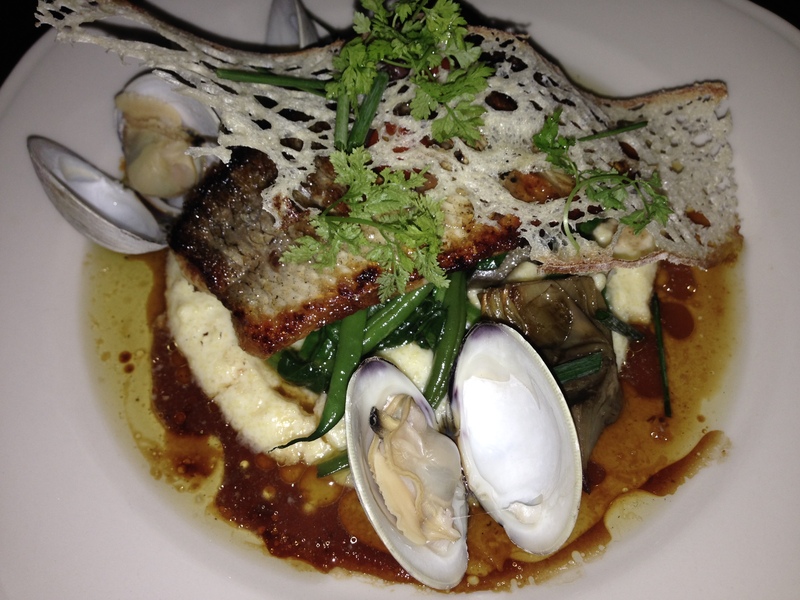 I was very happy with my choice and felt everything on the plate complimented the entire dish very well. One of my friends got the Sake Poached Mackerel. I didn’t try too much of it because it came with cilantro on it, but he loved it. My other friend got the Roasted Cauliflower Beer Cheese Soup (served, of course, with popcorn) and the Roasted Beet Salad. The soup was good but the standout, in my opinion, was the beet salad. 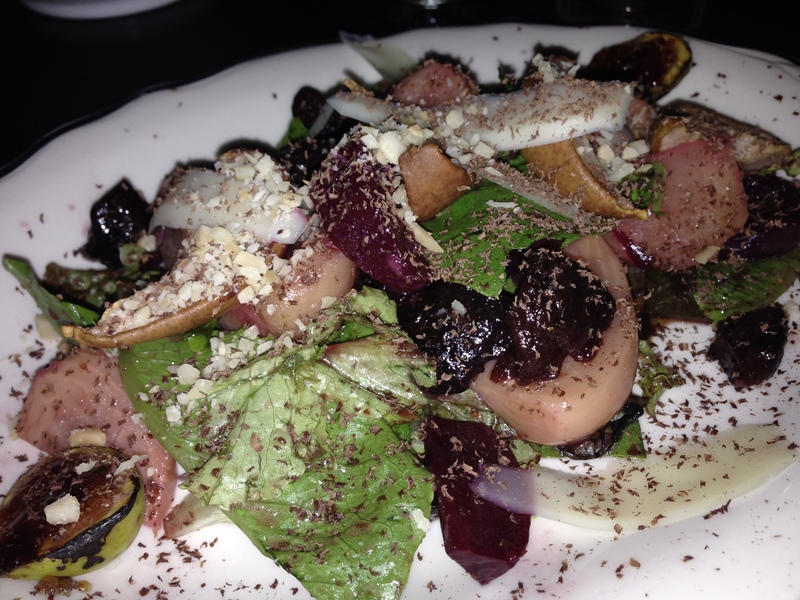 It came with beets, pears, goat cheese, figs and dark chocolate. I was impressed by the size of this salad and how many of the premium toppings (beets, pears, figs) it had on top. I’m not usually a fan of sweet salads but this one was exceptional. Time for dessert! They had three different options and of course the best one was the chocolate tart. It came with caramel sauce, a homemade chocolate nib and chocolate espresso ice cream. The amazingly buttery and flakey crust was filled with a fantastically smooth chocolate. The chocolate espresso ice cream had a fantastic flavor and actual ground espresso in it, which I loved! The little homemade cocoa nib was a great decorative addition but also stood out on its own with the unexpectedly crispy texture. I loved the dessert all together but the caramel sauce wouldn’t be missed if they took it off. FOODNOTES: The prices are what you would expect from a restaurant that got the hype it did before it even opened its doors. I don’t think it will become one of my regular stops because of the prices, but I will definitely be back again! I love the Asian flare throughout the traditional high-end Wisconsin tavern food. I loved the Tuna and Escolar Poke, and was exceedingly impressed that they were able to keep it so delicate with all of that flavor. I have never had such a perfectly cooked piece of fish as the one in my entree, and loved that my dish was balanced with both heavy savory flavors and light fresh flavors. 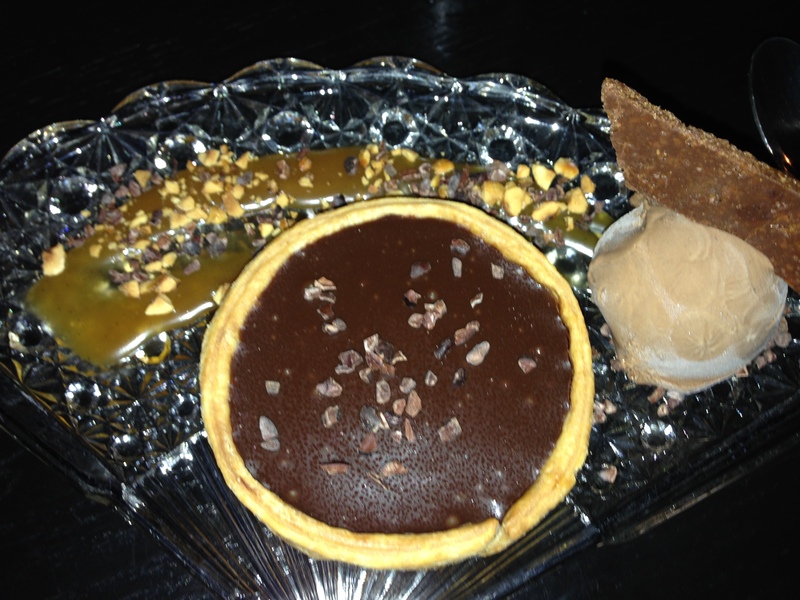 I’m not usually a sweets fan but that chocolate tart and chocolate espresso ice cream could convert me! I’m pretty sure I can speak for all three of us at the table and say we would all go back again (and probably will)!